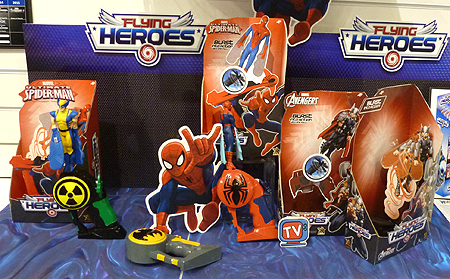 Flying Heroes toys are the new comic book hero toys from Character Options. Based loosely on the existing Sky Dancers dancing doll concept, Flying Heroes is aimed squarely at the boys toy market. 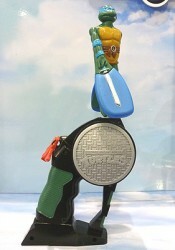 Fit the Superhero into its launch base, then pull the rip-cord to fire the Superheroes spinning into the air. 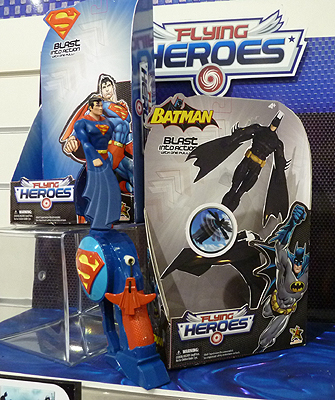 First to get the Flying Heroes toy treatment are DC Comics’ Batman and Superman, plus Marvel’s Ironman and Spiderman. Later assortments include Toy Story’s Buzz Light Year Flying Hero and Teenage Mutant Ninja Turtles Flying Heroes. Licensed by US giants Marvel and DC, and developed by multi-award winning UK toy innovators Character Options, Flying Heroes toys should literally fly off the shelves! This entry was posted in Flying Heroes and tagged Flying Heroes Toys. Bookmark the permalink.